Anguilla Liberty Dollar, July 11, 1967, made by Scott Newhall, then-editor of the San Francisco Chronicle (until 1971) and owner-editor of The Newhall Signal newspaper (owner 1963-78, editor until 1988). The Liberation of Anguilla turned into a trademark Scott Newhall escapade. It would be farcical if it weren't perfectly true. Always on the lookout for a zany antic to splash across the edtorial pages of the Chronicle — a tactic he used to beat William Randolph Hearst's Examiner in circulation, and later used at The Signal — Newhall embraced the so-called Anguillan revolution of 1967. At the time, the once-and-future British territory was a self-declared independent banana republic ruled by a petty dictator from a neighboring Caribbean island. The Anguillans wanted to wrest control from their neighbor and return to their former status as a British crown colony. To facilitate commerce for the revolutionaries, Newhall, an avid coin collector, took 11,600 dollar-sized silver coins and counterstamped them in the basement of the Chronicle building in San Francisco. The idea was, Newhall would be recompensed for his actual costs, and the new Anguillan government would sell the coins to collectors at a surcharge and keep the profits. It bombed. Just 2,000 to 3,000 were put into commerce, and Newhall was stuck with the balance of the defaced coins, which he eventually sold for the melt price of silver. 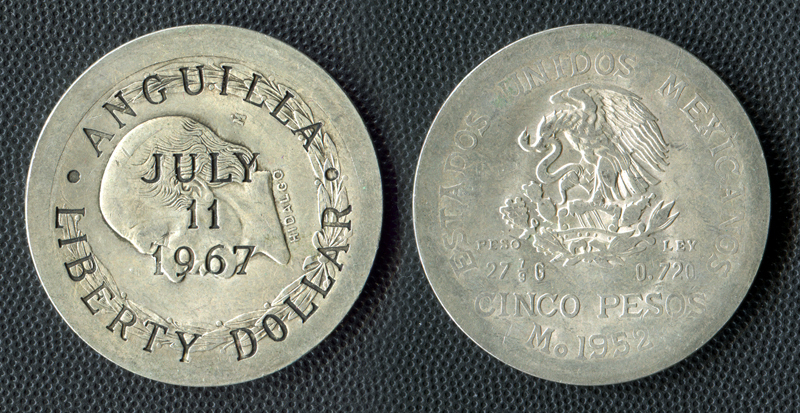 Newhall's 1967 Anguilla Libery Dollar counterstamps are known on coins of Mexico, Peru, Panama and Yemen. We have no way to know whether the example shown here — a counterstamped 1952 Mexican 5-Peso coin minted in Mexico City — was among the 2,000 or 3,000 that made it to Anguilla. What we do know is that the Anguillans took Newhall's idea and ran with it. They issued commemorative coins for sale to collectors at a premium in 1968, 1969 and 1970. The revolution continued in fits and spurts until 1969, when Anguilla was reunited with its Caribbean neighbors under direct British rule. 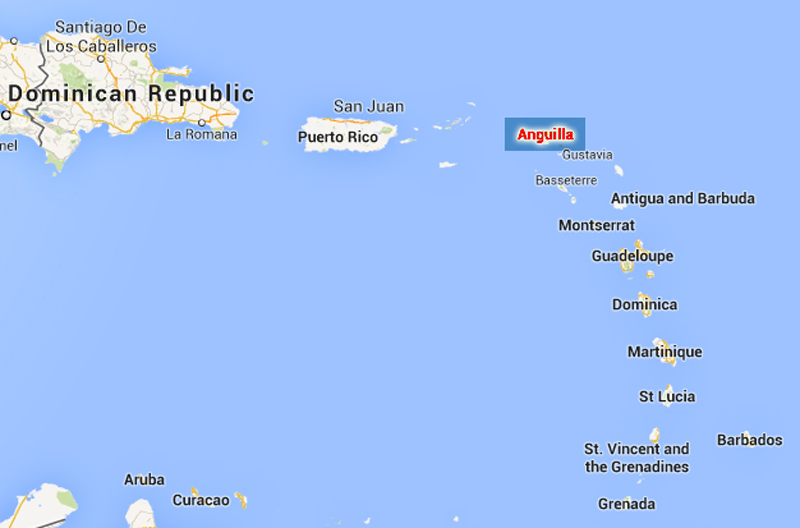 Anguilla was granted autonomy in 1976 and became a separate dependency (separate from its neighbors) in 1980. The following is the story of the Anguillan revolution, and the coinage he created for it, in Scott Newhall's own words. It's an excerpt from an extensive series of interviews conducted in 1988-89 by Suzanne B. Riess of the Bancroft Library at the University of California, Berkeley, where Newhall studied in the early 1930s. Riess: What's the Anguilla story? 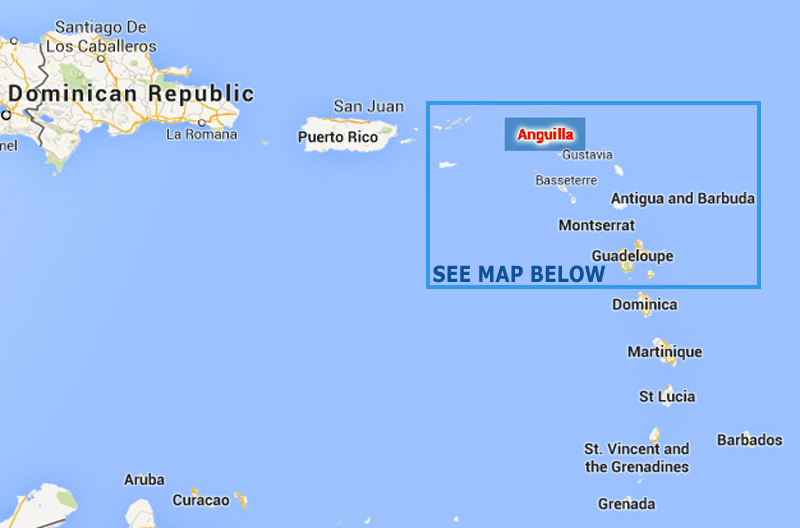 Newhall: Anguilla is a little island in the Caribbean. It's about a mile and a half wide, and about 8-10 miles long. It's right there in the curve where the Leeward Islands turn into the Windward Islands, right near St. Martin. Anguilla was a former British crown colony. Then when all the upset came and the British Empire began to dissolve and freedom and dignity returned to mankind, Anguilla was associated with St. Kitts and Nevis, another two islands, as a self-governing Caribbean state, associated with Great Britain. There was a lot of unrest among the natives. There always is down there in the Caribbean. ... The Caribbean crowd are something. Mind-boggling. St. Kitts was run by a fellow called Bradshaw. He was the sort of president for life of this Anguilla-Nevis-St. Kitts triple arrangement. This is what happens in all these countries. It's never one man-one vote. It's a million men-one vote. And the Anguillans were getting the dirty end of the shaft, as they say in the trade, because every now and then, some money would come through from Britain or the British foreign office or colonial office or whatever it is now, Commonwealth office, I guess. 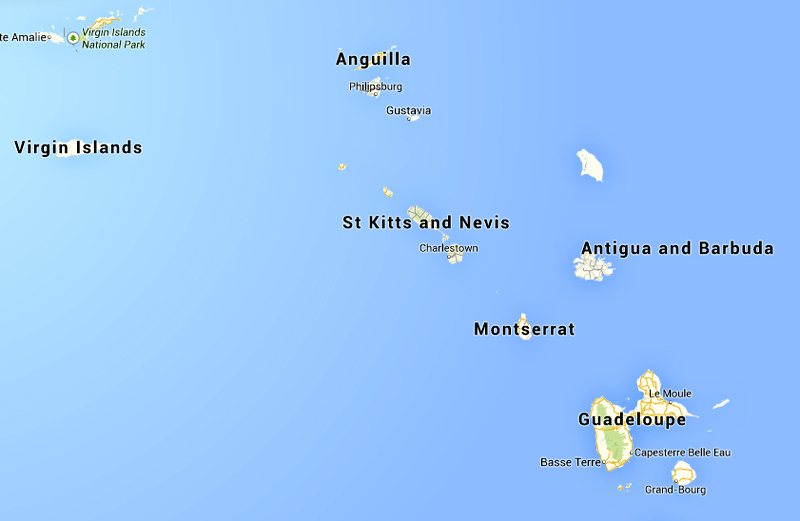 So much money for Nevis, so much for St. Kitts, so much for Anguilla. Well, Bradshaw got his hands on all the money. He took the Anguilla money and spent it on Anguilla, all right, except he did it by building a new big concrete wharf in St. Kitts and putting a big sign over it: "Anguilla Landing." And that was Anguilla' s share. Anyway, they had a lot of problems. Anguilla is full of the descendants of a whole lot of slaves who - I don't know if they were ever freed; I think their masters just left and there they are, so I guess they're free. They have about 10 different names on the island: the Hodges, the Gumbs, the Websters, the Adamses and so on, and there they are. They catch a few lobsters, and that's it. It is a miserable place. It's got two or three beaches, but there are no trees on the island. They’ve all been long since cut away or burned off or something. There never were very many. Anguilla was just a rocky, inhospitable outcropping. But today it is materializing as a resort island with nice beaches and some comfortable hotels. Or at least, so the advertisements say. Well, the revolution started with a beauty contest in Anguilla in 1967. The winner turned out to be a ringer from St. Kitts, not an Anguillan girl at all. The contest ended up with a shooting and somebody was killed, one person was, I think, and the Anguillans declared their independence from St. Kitts and Nevis. They got up a militia. You know, a ragtag affair. I read this in a wire story. There was some casual coverage of the rebellion. It was all very legitimate foreign news. The British navy got interested. I had recently seen "The Mouse That Roared," the Peter Sellers movies of a very tiny little nation that was declaring war on the rest of the world or had an H-bomb or something. This must have been in '67. Things were kind of quiet then. I had a vacation coming up, so I asked George Draper, a Chronicle reporter and an old friend of mine, to join me on a safari to Anguilla and see what the action was, and we could drum up some front-line coverage of the revolution. All outside communication with Anguilla supposedly had been cut off. We landed at St. Martin, which is a neighboring island, part of it owned by the Dutch and part by the French. The governor of the Dutch part just happened to be in the airport when he saw two American reporters arrive. There was a plane outside that apparently had been chartered by the Anguillans to fly some of their people back. There had been a number of inter-Caribbean conferences about the independence of Anguilla. It was a legitimate, interesting story. Correspondents were trying to get in. There was one vacant seat on the plane. I said to George, "You get over there. You're going to cover it. I'm not." As the plane took off the governor came storming in, waving his walking stick in hand, saying, "No more flights to Anguilla." So I went down to a little hotel, and the next morning I went over to the French half of the island, and I persuaded a local boatman with an outboard motorboat to run me over to Anguilla. Crossing that lousy strait, I'll tell you, in this boat, was a miserable experience. I had a white linen suit on, like a Victorian planter. Well, the suit got greasy from the bilges. It was one hell of a mess. The northeast trade winds made the crossing very rough. This crossing was very similar to a rough, uncomfortable voyage from Long Beach to Catalina Island in a cockle shell. I landed in Anguilla and was welcomed, in a manner of speaking, by some derelict guerrillas toting pistols and worn-out carbines. Bummed a ride in a truck down to the Valley, as they called it. There was nothing on that island, mind you, but a few trees and nice beaches, lots of rocks and the wind and a couple of churches. There are a few houses along in a row there in the biggest town. I met George at the airport, which was pretty much the center of information on the island. The landing strip was interesting. The Anguillans had covered the strip with these old oil drums so that "enemy aircraft" could not land and take over their island. They were expecting an invasion. We covered the rebellion of Anguilla in a series of stories. We taped most of it. I was very interested in it. I really was. It's not every day people are fighting for liberty and so on. At the island, we were living at Mrs. Lloyd's boarding house. Mrs. Lloyd was a motherly matron, but the cuisine at her lodging house was Spartan. Tuna sandwiches - we ate tuna sandwiches or tuna salad for five days, lunch and dinner, and sometimes for breakfast. One day, in walked Professor Leopold Kohr. He was an academic character whom Howard Gossage had dredged up. The good professor, a mild little man, was currently ensconced at Puerto Rico University where he was teaching the virtues of "smallness" as a social alternative. He's over in Wales somewhere now. Kohr preached a sociological doctrine in which small is good, small is beautiful, and the world is too big now, and we have to break it down into small units. He had been fascinated with Anguilla because here was an island of about the area of San Francisco, if you stretched it out, maybe a little bigger. I should make the story brief. But at one point after a couple of days on Anguilla, we thought the provisional president, Peter Adams, had been kidnapped. We grabbed a plane and finally found him in the air in another plane over St. Martin and got him back. It was interesting. Howard Gossage, the San Francisco advertising man ... was intrigued by the Anguilla Revolution. After George and I returned to San Francisco, I got together with Howard and Dr. Gerry Feigen and planned to spring Anguilla from St. Kitts and get them back into their old status as a crown colony of Her Majesty the Queen, which is what they wanted. The Anguillans felt that they would be supported better by Britain than by Bradshaw. Oh, lord, it was very complex. A whole book, "Under a Caribbean Sun," has been written by some Englishman who started giving us a hard time. In order to get things rolling, we brought the Anguillan government - the bankers and president and vice-president and foreign minister - to San Francisco. The foreign minister actually was an American citizen who had a fuel oil company in Perth Amboy, New Jersey, but he declared himself to be the foreign minister of Anguilla. They all flew into San Francisco. We borrowed the mayor's car. We designed flags for Anguilla and put the flags on the car and had press conferences in town. It all makes no sense, but anyway, it was intriguing. This was sort of half Chronicle and half me. The Chronicle covered it straight. I didn't use the Chronicle in this, really. Some people might think so. But I was honestly interested in it in a personal way. I've always been interested in coins. And we were going to try to save Anguilla, because they had been cut off from all funds, and there was a British navy gunboat supposedly lurking offshore. I don't think it was really there at all. The Anguillans had the militia out, and the padre, the local Anglican clergyman, had spyglasses and smoke signals. It would have been a beautiful movie. Take my word for it. But they needed money. Newhall: I was interested in coins. I said, "I will provide your coinage." And I almost lost my shirt. I got 11,600 silver dollar-sized coins, mostly from Latin America, and some from, I think, Yemen or Oman or something, and I counterstamped them. I had them struck here. I obtained some "ANGUILLA DOLLAR" dies and ran the trial strikes with the dies in the machine shop in the basement of the Chronicle, because there were some hydraulic presses down there. The coins were stamped "Anguilla Liberty Dollar." This is not all exactly journalistic, but anyway, it was sort of part of the act, 11,600 Anguilla silver dollars. I have it all written down somewhere. Then I sent Larry Wade, the Chronicle's promotion manager, down to the Caribbean with suitcases full of these dollars. They're heavy, boy. They're all silver. This was just when silver was going out of circulation. You see, silver coinage went out in '64 and this was about '67. The idea was that the Anguillans would take these Liberty Dollars and put them into circulation. They would reimburse me for my cost and keep for their government everything they could collect above the original cost. Coin collectors will collect anything. Commemorative coins, which are usually circulated and sold at prices above their silver value, have been a big business in the Caribbean area for centuries. Well, the Anguillan government officials began fighting among themselves, and they all began thinking that somehow we were cheating them. They tried to steal all the money from Larry Wade. At one point, I got a suitcase with 10,000 one-dollar bills and sent it down to Anguilla in order to loosen things up around the place. The members of the provisional government began confiscating that. It was a wild time. Anyway, I did mint all the Anguilla Liberty Dollars, and I sent them down. The New York Times got onto this. Remember, the Chronicle was not any part of this latest Anguilla activity. This was a free enterprise, a charitable effort by Howard Gossage and his group, "The San Francisco Group," as the Times called it. The Times was convinced we were trying to do something to take advantage of Anguilla. It was a very strange thing. In the end, I gave the Anguillans about 2,000 or 3,000 of these silver coins, so I wound up with about 8,000 or 9,000 dollar-sized coins that were worth at that time, I guess, $5 or $6 apiece. I finally was able to sell them for what cost I had in them. Then I washed my hands of the whole thing. This could have been a great story but unfortunately it seemed to get out of hand. The Anguillans are famous mariners. They have fast schooners. We were going to sail them up to New York. They wanted to get into the United Nations — see, that's a pretty good deal - so we wanted to sail them up to New York and tie up their schooner in the East River there, and then their foreign ministers and ministers of justice and the president of Anguilla would try to join the United Nations. It would be pretty good copy. However, they never did come to New York. The British took them back in 1971, and I guess that's where they are today. The Anguilla Revolution never exactly jelled as the perfect news story. It was just too complicated. We covered it straight in the paper. I was pretty sensitive, and because of my own personal interest in this particular matter I really didn't want to hit it too hard. If I hadn't been involved, I would have really given it a much larger play in the paper. Riess: Did you write any of the stories yourself? Newhall: No, I don't think so. Riess: Did Anguilla have a fairy-tale ending? Newhall: Well, the Anguillans got away from St. Kitts and regained their colonial status, which is what they wanted. However, the Anguilla story gave the Bay Guardian a reason for attacking the Chronicle. They tried to make this into a big Chronicle plot. I mean really, it was very murky. Riess: Because of a conflict of interest? Newhall: Well, just because of the Chronicle, or because of me. You know, Bruce Brugman has to make a buck, and he always has to have an enemy or a villain. He was always taking off against the Chronicle. He treated this, I think personally, very unfairly, saying that Anguilla was a Chronicle plot because I made these coins, some of them down in the basement there. He couldn't follow it. (Laughter.) It does sound complicated. It is an interesting story. Ruth [Ruth Newhall, Scott's wife] took voluminous tapes on the whole thing from everybody who was involved. And it was very involved. It would have made, I think, a fascinating and a great movie, but it didn't jell, and it was not essentially a Chronicle project. I'm sure Charlie [Publisher Charles de Young Thieriot] would have disowned it, and so would I have, as editor of the Chronicle, except in terms of what the Anguillans were doing. LW2422: 9600 dpi jpeg from original coin.